Previous practice questions have addressed how to identify people who are living with frailty and how to provide person-centred care for these individuals (Nelson 2017, Lyndon 2018). The English Longitudinal Study of Ageing found the overall weighted prevalence of frailty was 14%. Prevalence rose with age, from 7% in those aged 60-69 years to 65% in those aged 90 years or older (Gale et al 2015). Therefore, an increasing number of people now require complex support, which is being recognised as an important aspect of good quality health and social care provision (Sharp et al 2013). Once frailty is identified discussions with individuals, those close to them and members of the multidisciplinary team (MDT) should take place so that decisions can be made about treatment, prognosis can be acknowledged where possible, and plans made for the remainder of the person’s life (Koller and Rockwood 2015). Unlike non-modifiable incurable cancer and chronic diseases, people who are living with frailty experience vulnerability to stressors resulting in complex recovery and it is often difficult to ascertain prognosis. As a result, having early conversations about preferences for health and social care is essential for people living with frailty. Future planning can take different formats. The Gold Standards Framework (2018) covers advance care plans (ACPs), advance statement of preferences, advance decisions to refuse treatment and lasting power of attorney. It does not, however, cover the recommended summary plan for emergency care and treatment (ReSPECT 2018), which encourages people to have an individual plan so that they get the right care and treatment in a future emergency, where they no longer have the capacity to make or express choices. It is worth familiarising yourself with the different terms and their definitions so that you can signpost people you are working with. Future planning is a crucial component of comprehensive geriatric assessment, but you do not have to be a senior healthcare professional to listen, understand, document and share a person’s wishes and preferences for the remainder of their life. However, many healthcare professionals feel uncomfortable about initiating these discussions. Changing a leg ulcer dressing in a person’s home, assisting with personal care in hospital or helping someone to eat their meal in a nursing home are all examples of where opportunities may arise to have a discussion. Completing an ACP requires skill and relevant experience. Even if you are not the healthcare professional writing the plan with the person, you may be the one with whom they feel most comfortable having preliminary discussions. In clinical practice it is important to work within our professional boundaries based on our role, experience, knowledge and skills. While identifying that a person who is living with frailty would benefit from discussions about their future care planning, if you believe that you are not the best person to do this, then discuss with your team and line manager to work out who could. 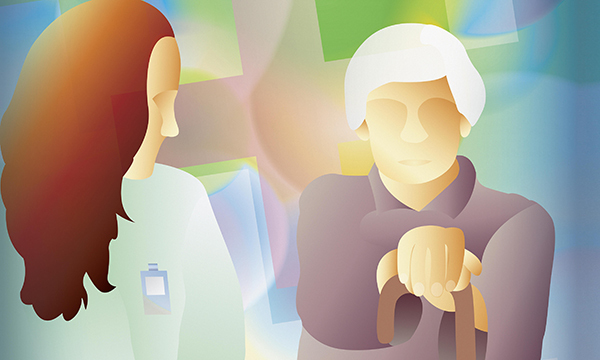 A cultural shift is required, however, that prompts all members of the MDT who work with older adults and those living with frailty to consider this discussion as being as vital as making a diagnosis, identifying mental health difficulties and assessing equipment adaptation requirements and social care needs. Many older adults wish to express their views to make an agreed plan that can be shared with health and social care professionals. Supporting people to make these informed decisions about the end of their life for whatever time they have left is the essence of person-centred care. Gale C, Cooper C, Sayer A (2015) Prevalence of frailty and disability: findings from the English Longitudinal Study of Ageing. Age and Ageing. 44, 1, 162-165. Gold Standards Framework (2018) Advance care planning. Koller K, Rockwood K (2013) Frailty in older adults: implications for end-of-life care. Cleveland Clinic Journal of Medicine. 80, 3, 168-174. Lyndon H (2018) How can I provide person-centred care for older people with frailty? Nursing Older People. 30, 4, 23. Nelson C (2017) How can I identify older people who may be living with frailty in my practice area? Nursing Older People. 29, 10, 19. Sharp T, Moran E, Kuhn I et al (2013) Do the elderly have a voice? Advance care planning discussions with frail and older individuals: a systematic literature review and narrative synthesis. British Journal of General Practice. 63, 615, e657-668.